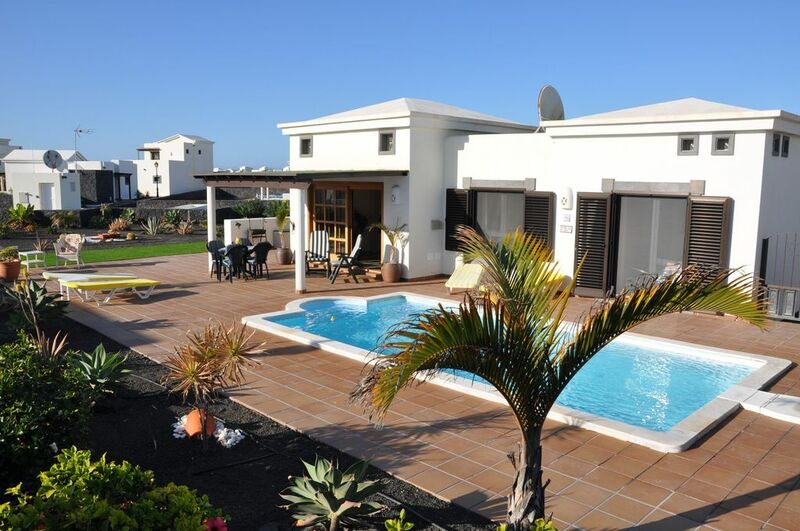 The best villa we’ve rented in Playa Blanca! An absolutely wonderful villa with all you could ask. The garden is pretty and pool nice and clean, thanks to Andy, the house manager. Enough sunloungers and beach towels. The kitchen is very well equipped for a foodie and there is a nice Weber charcoal grill in the garden. A very peaceful area close to the lighthouse (you can see it from the garden), but it is quite far from the city centre where most of the restaurants and shops are. The bus stop is quite close (bus going in every 30 mins and costing 1,40€) and there are also some restaurants and shops, but we recommend a car in order to carry your groceries and drinking water. A villa that can be recommended to everybody who likes to enjoy a little luxury in their holiday! Absolutely fantastic villa! Fully equipt with everything you need. We love this villa. We have been coming here for a number of years now. It is in a quiet area but very near to all amenities. The villa is well equipped, very clean and well maintained. The welcome pack is substantial and has everything you need which is a great plus especially if you arrive late in the evening. The villa manager is very helpful and also looks after the pool and makes sure it's the right temperature. We would definitely recommend this villa and like it so much that we stay there whenever we can and will be returning again in October. Thank you. We look forward to seeing you again soon. Nous avons passés de magnifiques vacances dans la maison de Robert, située au calme, dans un lotissement très aéré, disposant d'un très beau jardin et d'une grande terrasse ensoleillée dès le matin jusqu'au derniers rayons du soleil. Le tout très bien entretenu. Tout le confort y est. Rien ne nous a manqué. Nous avons fortement apprécié l'attention du propriétaire qui avait rempli le frigo, ce qui nous a fait très plaisir vu l'heure tardive à laquelle nous sommes arrivés. Pour les amateurs high tech, le wifi excellent, et plusieurs appareils multimédia sont disponibles dont l'IPTV dans plusieurs langues. Robert et Andy ont toujours été très disponibles pour répondre à nos questions. Andy vient deux fois par semaine pour s'occuper de la piscine. Une voiture est tout de même fortement conseillée. 10 minutes en voiture du centre de Playa Blanca. Das Haus bietet alles, was man sich wünscht: großer Garten, schöner beheizter Pool, geschmackvolle Einrichtung, voll ausgestattete Küche. Absolut zu empfehlen!